Fandango is Your Ticket to the Movies. 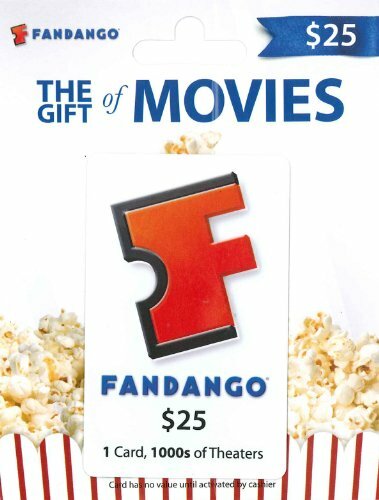 Fandango gift cards make the perfect gift for every occasion. Use to purchase tickets for theaters including Regal, AMC, Cinemark, Carmike and many others (go to Fandango.com to find a theater near you)! Fandango entertains, informs and guides film fans with must-see trailers and movie clips, exclusive and original content, insider news and expert commentary. We make it easy to find and buy the right movie at the right time, with showtimes and ticketing to more than 24,000 screens nationwide. Fandango is available online, and through our award-winning mobile and connected television apps with over 40 million downloads and counting. 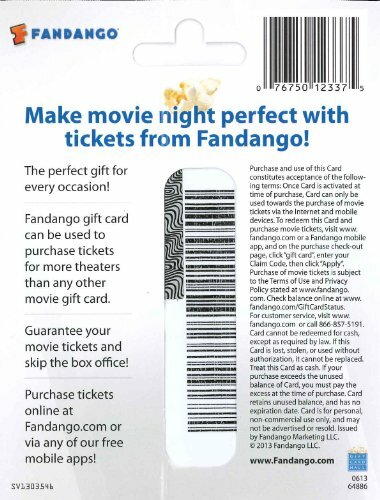 Fandango gift cards are redeemable online at www.fandango.com or via any of our free mobile apps. Cannot be redeemed directly at any Fandango partner theater box office. The perfect gift for every occasion. Skip the box office lines and purchase movie tickets in advance. Redeemable online at www.Fandango.com or via a Fandango mobile app. Cannot be redeemed directly at any Fandango partner theater box office or via the 1-800-Fandango voice telephone service. Amazon.com Gift Cards cannot be used as a method of payment for this item. No returns and no refunds on gift cards.